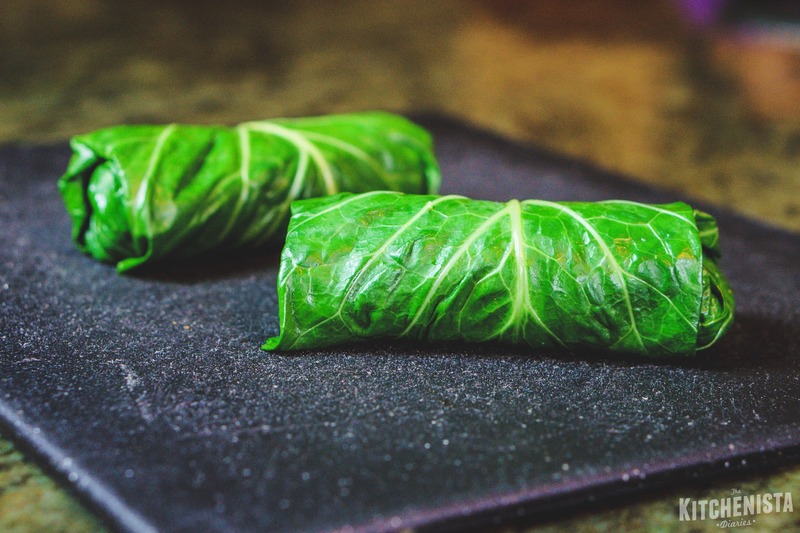 Collard green wraps were a staple for me during my first couple rounds of the Whole 30 program. I was admittedly skeptical when I started seeing raw unseasoned collard greens all over vegan and paleo blogs. 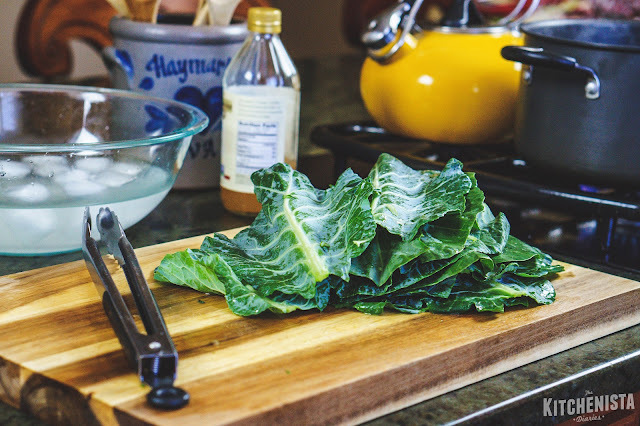 Collard greens are always something I associated with long cooking times (at the very least sauteed.) The leaves are pretty tough, which is an advantage for wraps because they'll hold up to being stuffed. However, they're a little too tough for the texture I'd want in a sandwich. 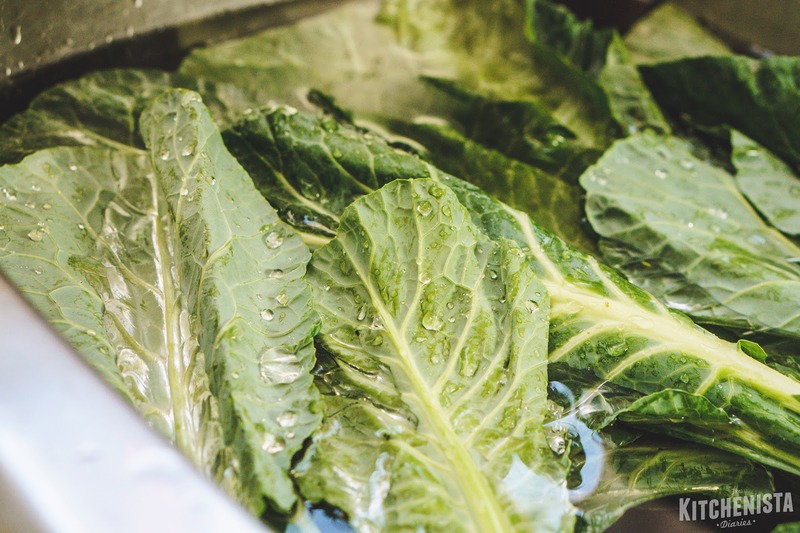 In the same way that raw kale salads are much more enjoyable if the kale has been thoroughly massaged, collard green leaves are transformed by a quick blanch in salted water. 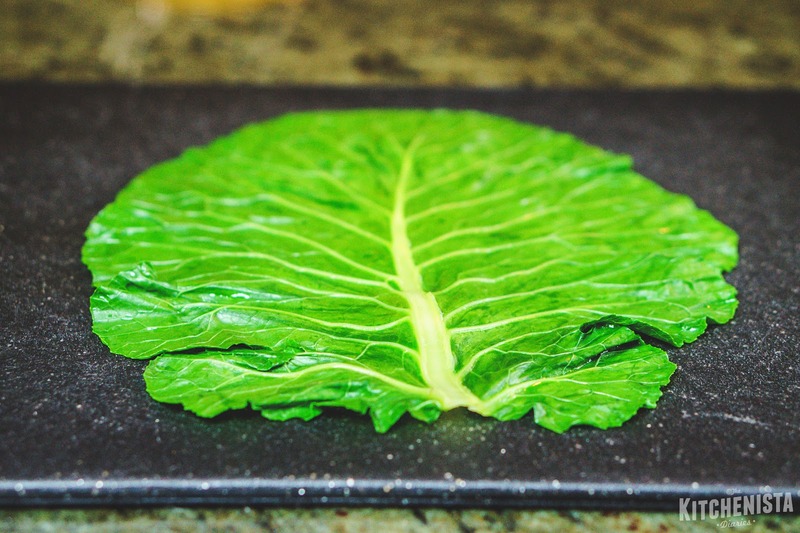 After a few attempts, I figured out a technique that works to yield tender, seasoned collard green leaves that make perfect sandwich wraps. They'll still have a bite and chew left, but it's a welcome crunch that doesn't take away from the sandwich itself. 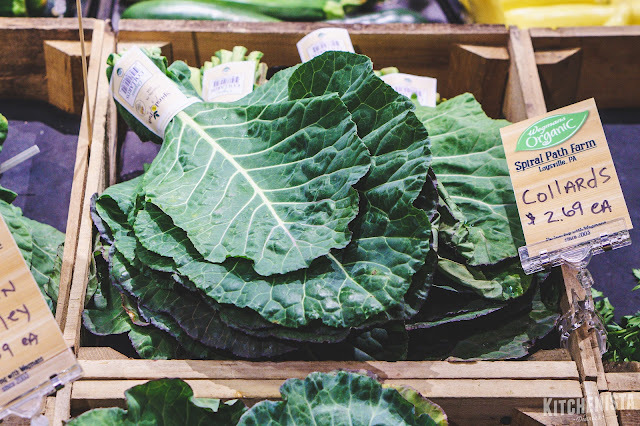 Obviously you'll be buying whole collard green leaves, which will need to be thoroughly washed once you get home. When you shop, look through the bunches and try to find the biggest leaves you can, free of holes or tears. It's much easier to use the wraps when you have one big gigantic leaf, but sometimes I just layer two smaller ones if necessary. I use a three step process to prep the leaves. First, I shave the thick stems that run down the center of the collard green leaves. Doing so makes the stems easier to bite and more flexible to fold as a wrap. Next, the collard greens are submerged for thirty seconds in boiling salted water. It's amazing how quickly the leaves become tender and bright green when blanched. The salt seasons the greens in the process. Finally, the blanched leaves are soaked in a bath of salted ice water and apple cider vinegar. 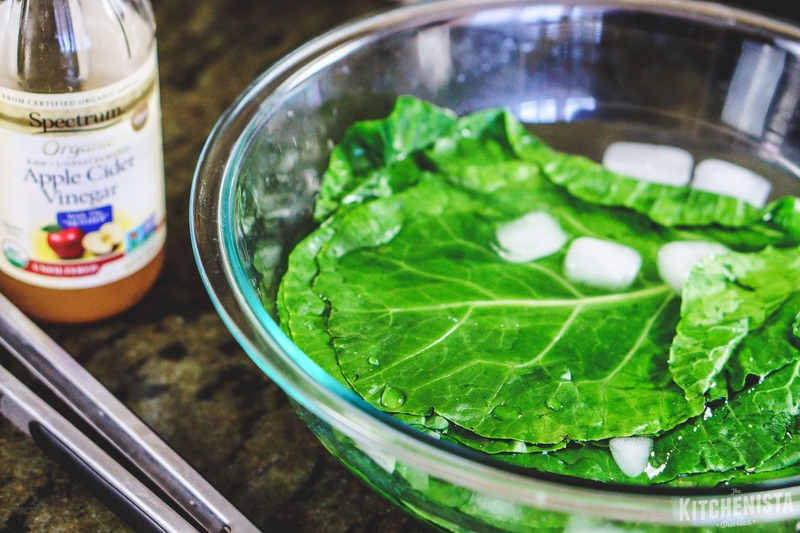 The ice stops the cooking process and preserves the color of the collard greens, while the salt and vinegar add a hint of flavor. While none of this is difficult to do, you'll just need to set aside the time for it. The good thing is that you can do a bunch (or more) at a time and store them in the fridge just like you would keep sandwich wraps. Also, because the leaves are so sturdy, you don't have to worry about soggy sandwiches if you're packing lunch to go. The first time I made them, I immediately wondered why I hadn't always been doing this! Having collard green wraps in my fridge really comes in handy for Whole 30 and any other time that I'm cutting back on bread. I also usually have cooked meat prepped for the week, so lunch is simple and compliant without having to think about it (or cook.) Most often, I use my wraps to make sandwiches with chopped grilled chicken breasts. 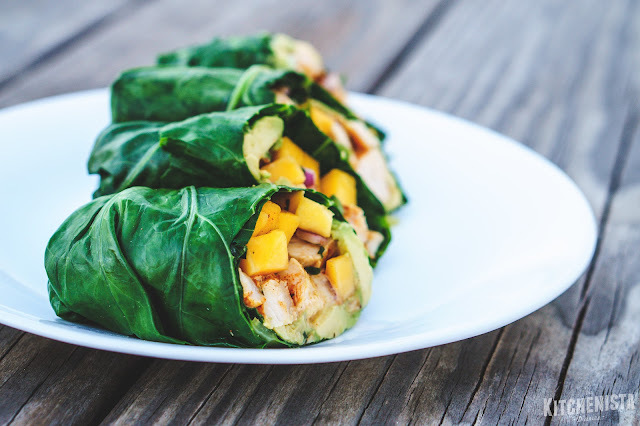 The wraps in the photos above were filled with spicy grilled chicken, avocado and mango salsa. 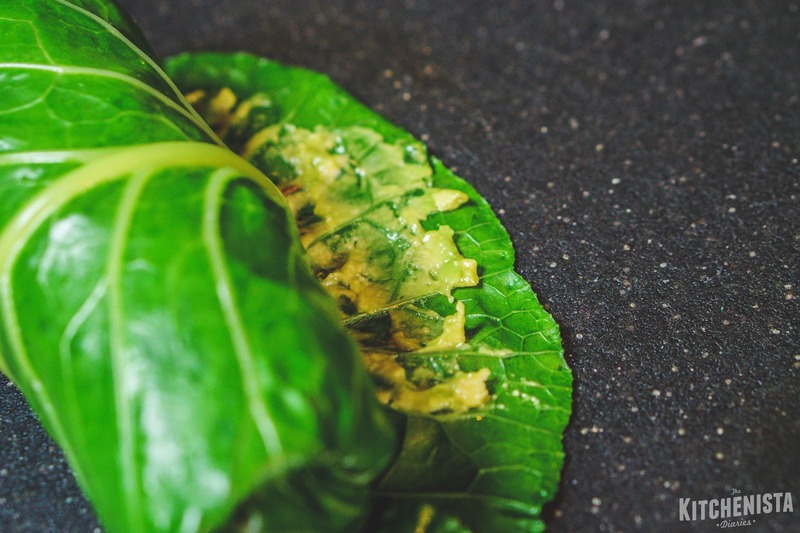 But collard green wraps are pretty versatile. Use them for cold or hot sandwiches, burritos, or even stuffed and baked in a casserole dish, smothered with a nice sauce. The sky's the limit, so once you get accustomed to prepping them you can have fun getting creative. 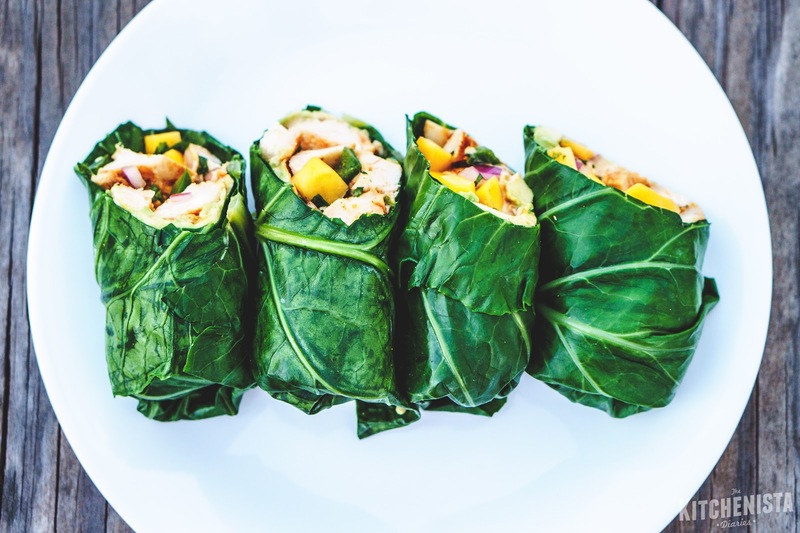 What I love most about the collard green wraps is how they make me feel so energized. I don't know how to convey that or if there's a nutritional reason behind it, but it's almost like getting a healthy food buzz. So beyond being guilt-free food, this is food that will actually make you feel great. 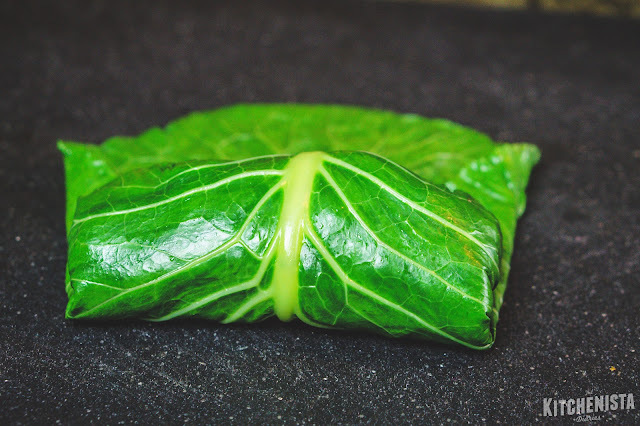 If you're excited to give collard green wraps a try, read on below for the step by step instructions! Fill up a clean sink with cool water and swish those greens around to rinse them of any grit or debris. Drain the sink, rinse the greens off, and repeat once more. While those are hanging out, bring a large pot of salted water to boil. Salt the water like you would for pasta or potatoes; enough that you can taste it. I like to leave the greens soaking in water as I continue with the next step. 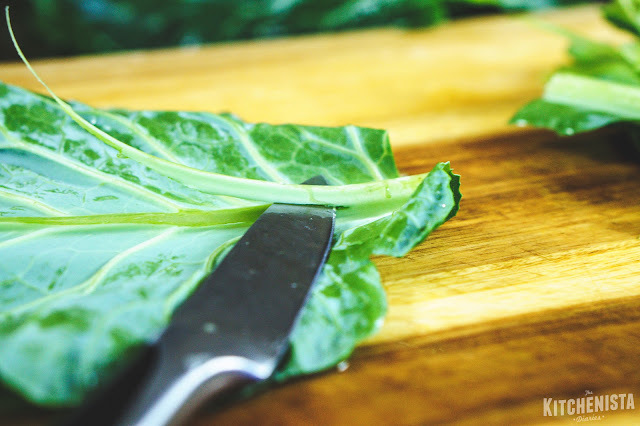 One at a time, place a collard green leaf on your cutting board and use your paring knife to carefully shave the thick middle stem. Just take off enough so that the stem feels flat, and try not to tear the leaf. You can also cut off the skinny end of the leaf to make a more even, rounded shape for your wraps. 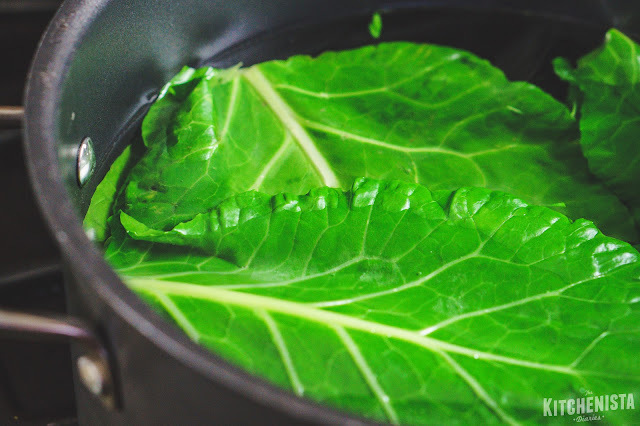 Prepare a bowl or container large enough to fit all of the collard greens. Fill it with salted ice water (as salty as the boiling water is) and a generous splash of apple cider vinegar. You should be able to taste the vinegar in the water. Drop the trimmed leaves into the boiling salted water, a few at a time. After 30 seconds, they'll be bright green and wilted. Transfer the blanched collard greens right into the ice bath. Let them hang out for 20 to 30 minutes. It won't hurt anything if you forget about them for longer though, trust me I have. After the collard greens have cooled and had time to soak, dry each one off between paper towels. I layer each leaf (or a set of two leaves if they're small) between sheets of parchment or wax paper. Then I slide the whole stack into a resealable plastic bag and keep it in the fridge for up to a week. It's just like having a package of traditional sandwich wraps in my fridge! 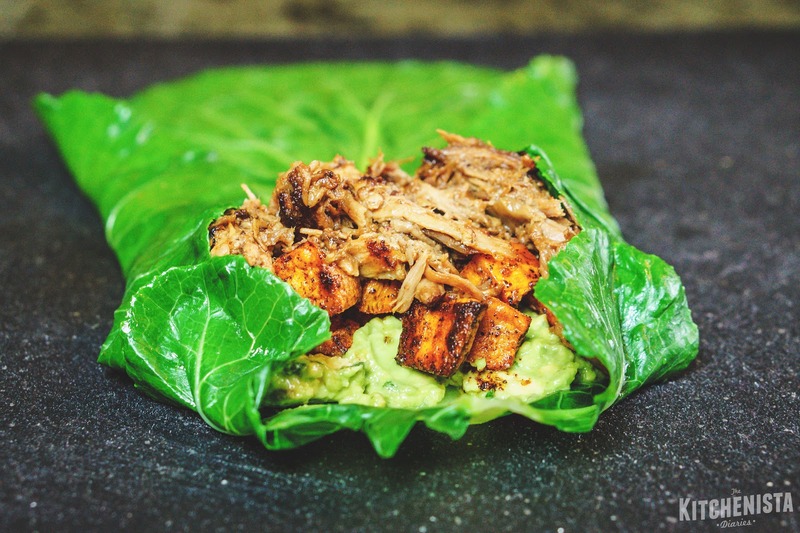 You can roll up the collard green wraps like you would with any tortilla or sandwich wrap. Tuck the sides in like a burrito or leave them open ended like the pulled pork and slaw wraps below. If you're using ingredients that are on the drier side, a little bit of aioli, mustard or avocado helps the wrap stick together. Lay one of the prepped and dried collard green leaves on a flat surface, like your cutting board. The side of the stem that you trimmed should be facing up. The larger the leaf, the more easily you'll be able to roll everything up. If you're stuck with smaller leaves, you can overlap two to get more surface area. Pile your fillings on the bottom center of the leaf. I like to include something that will help everything stick together, in this case a layer of guacamole holds together chipotle sweet potatoes and pulled pork. Fold the sides of the leaf in towards the center, then the bottom, so that the filling is cradled. With your hands helping to keep the sides of the leaf tucked in, roll the wrap from the bottom, like you're folding a burrito. A dab of whatever condiment you used spread on the inside of the wrap will help the last piece of the leaf stick to itself. All rolled up! 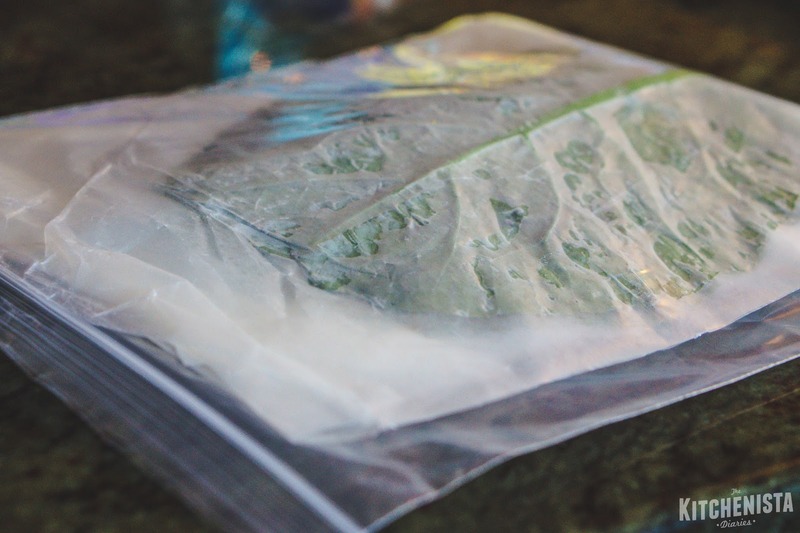 If you're traveling with the wraps it's better to leave them whole and wrap in wax paper or plastic until you're ready to eat. If you feel compelled to cut them (like I did, but mostly for presentation) a serrated knife is easiest to use. Hope this helps! This is a fantastic idea! 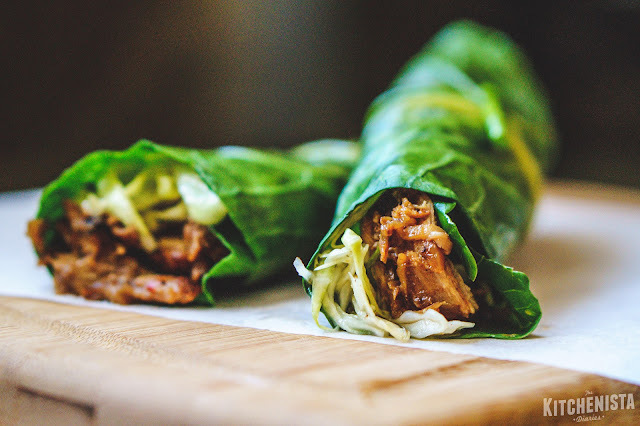 I stuffed perfectly crunchy, pliable collard leaves with pulled pork, slaw and pickles for a tasty lunch. 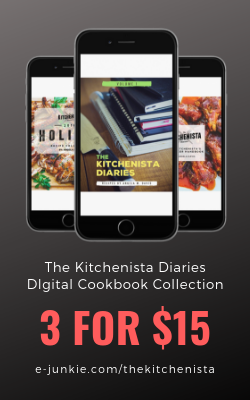 Thanks Kitchenista! I will be trying this for my lunch for my first week of Whole 30! This makes so much sense. I can't wait to try this later today. Thanks! Your pictures and instructions are so motivating! Definitely making this a staple of my 2018 lunch menu! I want to type in all caps but I won't bc that's annoying. 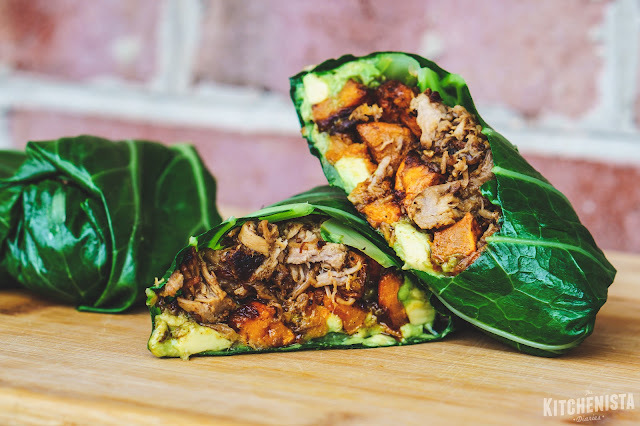 How did I not know using collard greens as wraps was a thing?! I've been paleo for a long time. I follow a ton of paleo and whole 30 bloggers and on insta. I just saw this in an email from a grocery store with a recipe for Mediterranean lettuce wraps. I looked at the picture, and I'm like that's not lettuce. Then I had to google it to see if you could eat them raw. And it's a thing!! Which is how I found you btw. 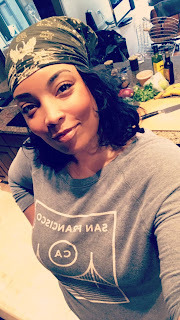 I typed collard green wraps in pinterest and my head blew up!!! OMG How did I not know this?! I'm constantly pinning Whole 30 stuff, and yet I've never seen this. Should have been following you apparently!!! Your combinations look really good by the way!!! 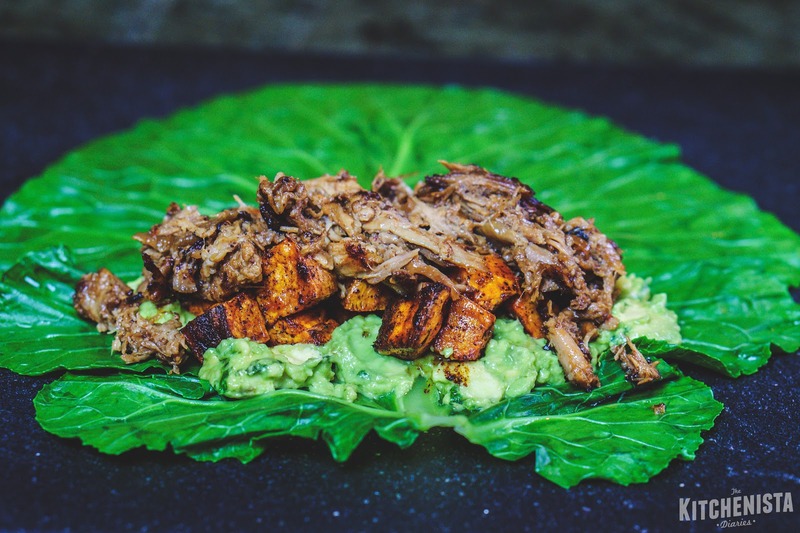 That pulled pork, guac, potato thing looks awesome. and I really like the idea of putting salt and vinegar in the ice bath. Collard green wraps made whole30 so much easier! Loved packing them for lunches. Glad you found it! I love your technique, your clear instructions ... and the splash of vinegar is genius. I'd tried another recipe before yours, and the results tasted like shoe leather. That little bit of vinegar, though, really brings the collards to life. I used this recipe throughout a Whole 30 last year, and I'm getting ready for another one. So glad to have a *good* replacement for my lunchtime sammies! Glad it works for you! That vinegar was key for me too!